Become a Preferred Card Holder Today! 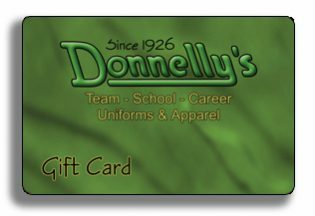 – Purchase a Donnelly’s Gift Card for as little as $10. – Ask us to attach your card to your customer account. – Special Offers Exclusively for our Preferred Card Holders. – Earn Reward Points* based upon your purchases. One card per family will accumulate benefits for all your children, even if they attend different schools. Each January, Reward Points are calculated based upon your previous years’ purchases. You earn 1% for every dollar spent last year times the number of years that you’ve been a preferred card holder. The more you purchase and the more years you are our customer, the more you earn to be used in the future. It is our goal that the average customer who starts with us in kindergarten will earn enough points to get free uniforms for a whole season by 8th grade.